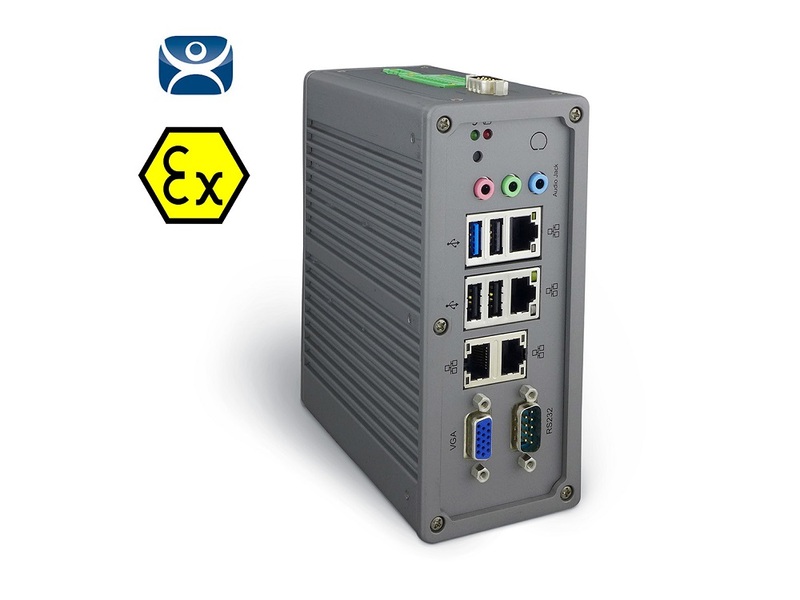 The AIS ThinManager-ready, Rugged, Thin Client and DIN Rail PC with ACP-enabled BIOS is designed and certified to meet NEC/CEC Class/Division, ATEX Directive 94/9/EC, and IECEx Zone standards for increased safety in industrial PC in Division 2 and Zone 2 control, measuring, testing, data collection, and communication applications. AIS offers UL Class 1 Division 2 (C1D2 or Class 1 Div 2), Groups A, B, C, D, T4A, ATEX 94/9/EC Zone 2 Category 3, and IECEx Zone 2, Ex “nA”, T4 certification on its Hazardous Areas Industrial Din Rail PCs and Hazardous Locations (Hazlocs) embedded computers which are primarily designed for the volatile and harsh environments. Other features are: highly flexible interfaces and expansions; 1 x USB 3.0, 3 x USB 2.0, 4 x GbE, 1 x RS232, 1 x RS485, 1 x DIDO, 1 x VGA and audio ports. The AIS ThinManager-Ready®, Rugged, Thin Client and with ACP-enabled BIOS is designed and certified to meet NEC/CEC Class/Division, ATEX Directive 94/9/EC, and IECEx Zone standards for increased safety in industrial PC in Division 2 and Zone 2 control, measuring, testing, data collection, and communication applications.